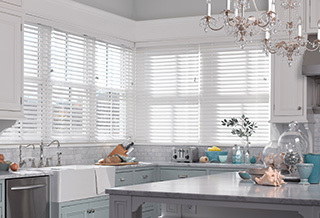 At Budget Blinds of Kitchener & Guelph, we're your local neighborhood experts that truly understand your needs. We're in your neighborhood, we know the local Kitchener & Guelph weather and community, and we’re backed by the #1 provider of blinds, shades, and drapes in North America. Over 25 years of customer satisfaction gives you peace of mind that only comes with choosing the proven leader. We bring the showroom to you in Kitchener & Guelph. We expertly measure your space, install beautiful window treatments, and back it up with the best warranty in the business so you can sit back and relax in the beautiful, Kitchener & Guelph weather and sunshine. We serve to give you the best in window treatments, so you can rest easy knowing your space will be beautified and optimized with window treatments that fit your individual needs. Ready for feature-rich, state-of-the-art window fashions that stand the test of time? Then welcome to Budget Blinds of Kitchener, your one-stop resource for blinds, shades, shutters, and drapery that make your house the home you’ve always dreamed of. It’s easy to see why Budget Blinds of Kitchener is backed by the #1 provider of custom window coverings in North America. Our sumptuous selection of fashion-forward window treatments, combined with our unique, personalized approach to custom design, ensure you’ll have years of “uber” style and windows that smile. And to make the design process easy and convenient, we’ll even bring our gallery of custom window fashions to you, in the comfort of your own home. In essence, Budget Blinds of Kitchener, from the University of Waterloo, to Victoria Park, and beyond, is the authority when your home’s décor is a priority, and we do it all for you! And as a member of the Optimist Club Lakeshore Village for 28 years, we’re proud to be a part of the Kitchener community. I enjoyed my experience with the Budget Blinds team. Both gentlemen were pleasant and knowledgeable. I have already recommended your company already. Thank you for providing such prompt and high quality service! As a business owner, I respect and appreciate such great customer service throughout the entire process. Thanks! I would feel comfortable referring Budget Blinds to family, friends and neighbours. We were pleased with the in-home consultation, and the roller shades. The installer, John, was patient, and made sure the shade was perfectly hung and sat correctly on the ledge. Very friendly & helpful.